 San Diego Charter Bus Company provides top-of-the-line charter bus, motorcoach, and minibus rental services in the greater San Diego, California area. Our experienced reservation specialists book buses for trips of all shapes and sizes for groups across California. Call 619-209-7804 and let our reservation experts review your itinerary, provide a quote, and help you reserve the perfect coach bus for your trip! 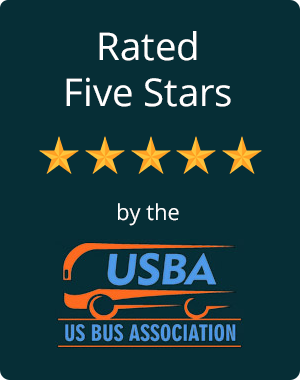 With years of experience, multiple bus models to choose from, and a helpful 24-hour staff, we’ve built our reputation as one of San Diego’s top charter bus companies. If you’re looking for group transportation in Southern California, book a quality charter bus or minibus with our knowledgeable team! Our company works with leading transportation providers to service conventions, weddings, university events, and more. No matter what brings you to San Diego, you can rely on us to streamline your trip every step of the way. Whether you’re traveling with a group of professional athletes or little league players, you’ll have ample room and amenities for a comfortable trip. Head to the big game in style and leave the navigation to your driver. San Diego’s engaged couples and wedding planners turn to us to help plan the big day. We’ll build you a fleet of safe, reliable vehicles to transport your wedding party and guests to and from each venue. Heading to San Diego for a corporate convention, training seminar, or other business related event? We’ll help you efficiently coordinate your itinerary and choose the best vehicle for your clients and employees. Travel to academic and non-profit events knowing your group is in good hands. Take a shuttle or motorcoach to fundraisers, volunteer opportunities, conferences, extra-curricular events, and more to keep your group safe and on-time. Travel with your family, friends, or church group to San Diego’s top events and attractions. Keep group members organized on one bus while a driver transports you to every stop on your itinerary. We’ll handle the driving while you focus on enjoying your trip! With their spacious luggage bays and convenient on-board restroom, full-sized charter buses are perfect for long-distance trips. Each bus is equipped with plenty of room to comfortably transport your group and personal belongings for any occasion. Plush seating and added legroom make long drives more enjoyable for passengers of all ages. Shuttle friends, family members, or event attendees around town in a luxury minibus from San Diego Charter Bus Company. Each minibus’s compact size and affordable price makes it a great option for small groups. With access to 18-passenger buses, 25-passenger buses, and more, we can always pair you with the perfect minibus for your group. Why not take a walk on the wild side at one of the most revolutionary zoos in North America? The San Diego Zoo boasts open-air, cageless exhibits designed to replicate the residents’ ecosystems, meaning you’ll be nearly face-to-face with the animals in their natural habitat! With a private bus rental, you can visit the elephants, rhinos, giant pandas, big cats, reptiles, birds, and much more without sweating the transportation and parking details. When you’re done exploring the San Diego Zoo, explore the surrounding greenery at Balboa Park. This urban greenspace is known for its winding pathways through open gardens and the gorgeous architecture of the park’s numerous museums, like the San Diego History Center, the Natural History Museum, and many art galleries and theaters. With lush scenery and stunning San Diego cultural centers around every corner, visitors can shrug off the hustle and bustle of city life while wandering the grounds. Have you ever wanted to step foot in a floating piece of history? At this dockside naval museum, you can! Once the longest-serving aircraft carrier of the 20th century, the USS Midway is now on permanent display in San Diego’s Navy Pier as an interactive museum. This popular San Diego attraction features over 30 restored aircraft and 60 onboard exhibits, offering visitors a glimpse into the world of maritime aviation. This picturesque stretch of beachfront is perfect for those in search of sand, surf, and sun. The Cove is part of a protected marine reserve and is home to a diverse array of aquatic wildlife, making it a popular spot for snorkeling and scuba. The beach is within walking distance of tidepools, beach caves, and quaint local shops and restaurants, so plan to spend an entire day taking in all that La Jolla has to offer. This historic district is a must-see for any out-of-towner who seeks a taste of local life. From widely-acclaimed dive bars and cocktail lounges to festivals and concerts in the Spreckels and Balboa theaters, this 16-block stretch of downtown San Diego provides plenty of entertainment options for a lively tour group. Need to get away from it all? We recommend taking a day to hike through this wild span of Southern California coastline. Trails take visitors across a rocky plateau to a scenic overlook of the Torrey Pine State Beach. Here you can stretch your legs and breathe in the ocean air to the sound of migrant seabirds and crashing waves. An hour drive away from San Diego city center, this LEGO-themed amusement park and resort is well worth the long haul for youngsters and the young-at-heart. Attractions include an aquarium and waterpark, numerous roller coasters and rides, and a miniature park with small-scale replicas of the country’s iconic monuments and buildings. Perched on the southernmost tip of the Point Loma Peninsula, this monument and park marks where Europeans first set foot on the North American west coast in 1542. Come explore the historic lighthouse, inspect the wildlife in the Point Loma tidepools, or simply take in the panoramic views of the Pacific Ocean. On clear days, you can even spot parts of Mexico from this scenic lookout. This historic beachfront amusement park offers visitors thrills and entertainment with a vintage flair. Whether you’re here for a ride on the Giant Dipper— the park’s wooden roller coaster first constructed in 1925— or a leisurely stroll along the boardwalk shops and restaurants, Belmont Park is an iconic San Diego landmark you will not want to miss. If you’re looking for oceanfront recreation, you’ve come to the right place! As the largest man-made aquatic park in the country, this 4,235-acre span of shoreline and paved trails attracts water skiers, wind sailors, campers, joggers, roller skaters, cyclists, sunbathers, and other outdoor enthusiasts from all over town. 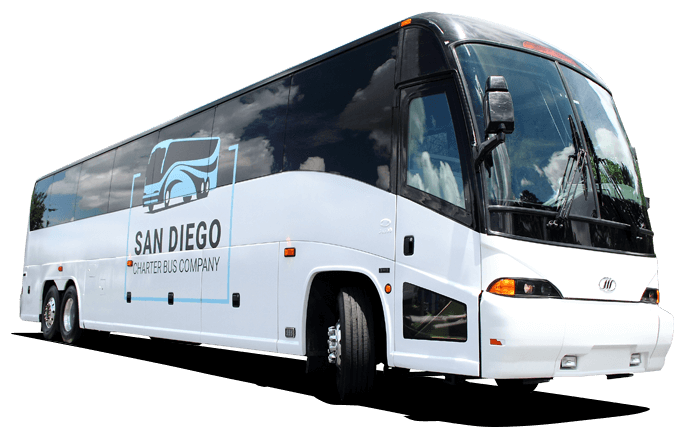 When you book with San Diego Charter Bus, you can enjoy efficient and reliable private transportation to any San Diego attraction. Whether you’re a local in need of a quick shuttle across town or you require a ride from across California or neighboring states, we can craft the ideal fleet for you. Our track record for providing quality services for any San Diego event, from beachside weddings to memorable field trips, makes us the best choice for all your travel solutions in the area. Need help getting started? Our team is available around the clock to assist you with any transportation-related inquiry. Call 619-209-7804 today for a free, no-hassle quote! Though San Diego has multiple neighborhoods to explore, we’ve narrowed down this list to include our passengers’ favorites. Get the most out of your San Diego trip by visiting these top neighborhoods! The Gaslamp Quarter is perfect for bachelorette parties, after-work gatherings, and late nights with friends. Home to some of San Diego’s best nightlife spots, this lively neighborhood brings together all of the city’s party animals on a nightly basis, providing great food, great drinks, and good times to visitors and locals. Try the Altitude Sky Lounge for drinks with a view! Old Town is home to some of San Diego’s richest history. Dating back to 1769, this city was the first Spanish settlement established in what is now the state of California. Explore the neighborhood’s history at the Old Town San Diego State Historic Park, or enjoy delicious hand-made tortillas at Cafe Coyote. True to its name, Little Italy is the perfect place to try delicious authentic Italian food in San Diego. From pastas to cappuccinos to cannolis and everything in between, you’ll find a plethora of restaurants and markets here to satisfy your cravings. To dive even deeper into the city’s Italian heritage, visit during the annual Little Italy Festa! Pacific Beach’s beautiful coastline, surf-town vibe, and lively nightlife scene make it an excellent vacation spot for visitors. Start your day with breakfast at World Famous, take a stroll down Crystal Pier, hit Backyard Kitchen & Tap to try a few new beers, and finish off the day at Pacific Beach Ale House for the best Pacific Beach experience. Just north of Pacific Beach, La Jolla is home to beautiful sea caves that can be explored by kayak. You can also spend the day relaxing on the sand and enjoying some of the most gorgeous views in San Diego. Or, if you’ve had enough of the beach, stop by the Museum of Contemporary Art San Diego to enjoy some air conditioning and fine art!